BB4 as an UAC hangs around the Gujarat/Sindh border as an UAC at 700 mb. Another UAC lingers over south Rajasthan at 850 mb. 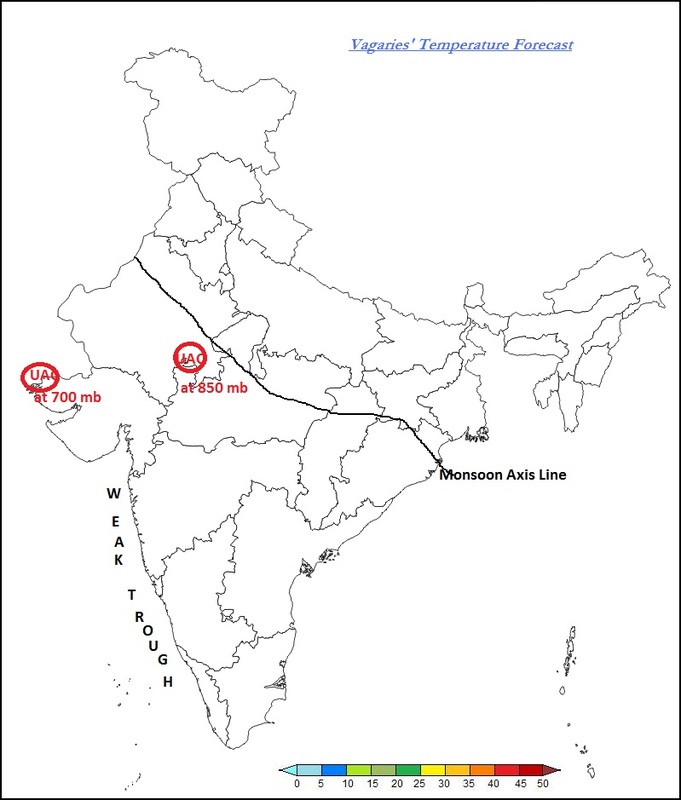 The monsoon axis line is shown in the vagaries map. a) The west coast trough gets weaker, and reduced rainfall along the west coast and south Gujarat. Both the existing UACs vanish. b*) The monsoon axis shifts northwards (gradually), and reaches the Himalayan foothills. Reduced rainfall along west coast, NW India, Central India and Northern and interior Peninsula. Also dry into southern regions of Pakistan. But, Increase in rains over the Himalayan states, Northern U.P., and Gangetic belt and NE states. Subsequently, increased precipitation in Nepal, and Kathmandu can overshoot the month's normal figure. More precipitation for Northern regions of Pakistan, upper Punjab and adjoining areas, and Northern regions. (b*) developments would would gradually occur in 3/4 days during this week. 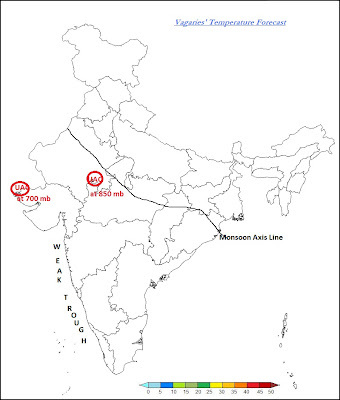 a) Monsoon axis remains along current line, with normal precipitation along its length. West coast trough can fluctuate from weak to strong. Southern Sindh coast showers may linger along coast for a couple of days into the week. Western Nepal continues to get rainfall. b) An UAC can form in the bay and move inland towards the end of the week (27th/28th). Possibilities of precipitation in Delhi, Haryana and NW India. c) Another weaker UAC, seen forming in the in the southern Bay, can strengthen and bring some precipitation into T.N. Next 2/3 days developments will be the indicators. The latest runs of GFS (00Z) show very heavy rain creeping up the West Coast upto Mumbai by Wednesday, with heavy / very heavy falls indicated on Thursday / Friday. Not quite sure what's going to cause that - may be a UAC at 700 mb along the coast or the trough strengthening again (due to what?). I guess the next 2-3 days will reveal what's coming as you have mentioned Rajesh. In any case the GFS forecasts sometimes completely change in 12 hrs. The vagaries forecast and the comment have left me all confused. As per the vagaries readings it was reduced rains to south gujarat in both the A & B scenarios - right? BTW sorry to seem dumb but - whats UAC? Rain, lightning happening offshore from Mumbai and also just South of Mumbai currently at 3:50 PM IST. The sea south of Saurashtra looks full of clouds too (some at -50 Celcius). 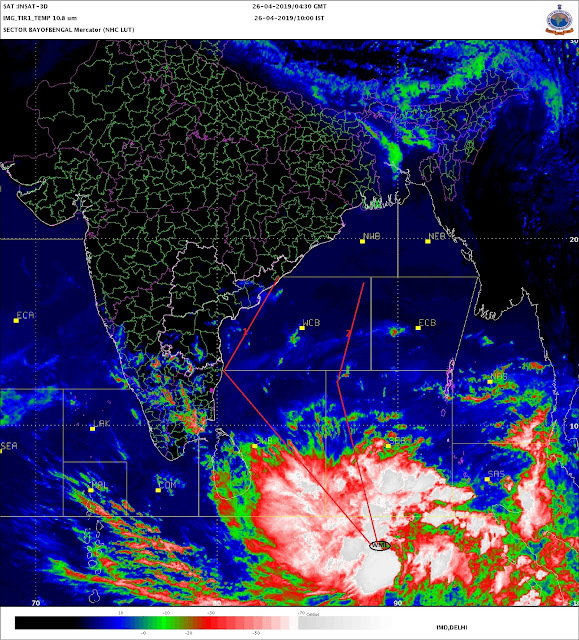 Looks like some kind of a system has developed in the Arabian sea off the Konkan Coast today morning causing all this. I was expecting to see a very calm weather around Mumbai today and for a few more days. Satyen: UAC refers to "upper Air Circulation" They are different levels in the atmosphere. As on Monday, option 2., MJO showing no signs of weakening. But, our analysis is over a week, and MJOs do not supress overnite. South Gujarat? Reduced rains in option 1. and same till a UAC forms in option 2. I have mentioned of the off shore trough going "on and off" in an active MJO..